The Samsung Galaxy A9 is here... and the big thing is that it will have not two, not three, but four cameras at the rear. While the world gets used to multiple lenses on the rear of their phones, Samsung is upping the ante yet again with its Quad Camera – as rumored earlier this week. The four cameras are as follows: camera 1 is the main 24MP camera and that will come with a flash, f/1.7 maximum aperture and Clear and Bright functionality (we are guessing this is a software addition). Camera 2 is the telephoto lens, with a 10MP sensor, f2.4 and a 2x optical zoom. This has Scene Optimiser, which uses AI scene recognition to identify the subject and adjust settings accordingly . Camera 3 is the en vogue ultra-wide lens that has 8MP, f2.4 and a 120-degree range. And last but not least, the fourth camera is a Depth Lens - 5MP, f/2.2 and Live Focus. This camera gives you the ability to manually control depth of field and focus on the subject. The Samsung Galaxy A range is beginning to shape up as one of the best camera phone ranges around. 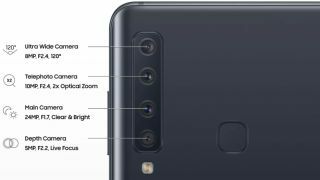 Earlier in the month, Samsung revealed the Samsung Galaxy A7 - which boasts a triple lens setup that is set to take on the Huawei P20 Pro. If the camera does indeed come with four rear lenses then it will beat the Lenovo S5 Pro to market, which is also set to come with four cameras on the rear. While LG's five camera setup (rear and front) was recently revealed as the LG V40 ThinQ. Will any of these eventually get the best camera phone crown?